Dog Food Scoop is made up of a small pack of dog enthusiasts. I'm Sandy, the leader of the pack, and our ever faithful No. 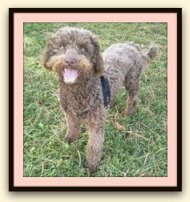 1 supporter is our adorable, one-and-a-half year old, chocolate miniature Goldendoodle. (Take a peek here at our favorite site on Goldendoodles). We've been dog owners for 40 plus years and cannot envision a life without these wonderful creatures. How they enrich our worlds with their companionship, loyalty and unconditional love. Each day they bring us such joy and laughter with their unique personalities and funny little ways. Dogs also offer us unlimited free therapy and extraordinary comfort! They teach us so many valuable lessons. And during those dark days, they can sometimes be our sole motivation for getting out of bed. I recall the day my company downsized, and I was suddenly without a job. I arrived home dazed and depressed. And there he was, my precious little pooch prancing up and down in circles, positively overjoyed to see me home so early. We sat together on the floor and I told him the bad news. He simply kicked his warm welcome up a notch, adding in a few extra hugs and wet kisses. This continued for a few minutes -- me telling him what a bad day it really was, and him telling me what a great life it really was. Very quickly the dark cloud began to lift. My whole mood changed. I felt how he was trying to teach me to embrace all the things I should be grateful for -- his love, and so much more. Dogs have an instinctive way of teaching us not to take ourselves so seriously. We picked ourselves up, dusted ourselves off, and went for an exhilarating jog together. He was right, how could life not be great with such a devoted and precious, best friend always by my side. So, Why a Dog Food Comparison Site? No kidding, there certainly are many far more fun and exciting doggie themes to write about! So, why a website on dog food comparison? It's a long story and, unfortunately, a very sad story. Like many, many other consumers, we too were once terribly trusting, naive and gullible about dog food. And as a result now, amid all our very wonderful memories, we also have some heartbreaking memories. We learned our lesson in the most painful way possible, and we now take this subject very personally. We feel a sense of moral obligation to try and spread the word. If we save just one of our fellow dog parents and their innocent, furry companions from the agonizing pain we experienced -- then our job will be done. Our story begins a couple of years ago. Suddenly, within a matter of weeks, a number of our adorable furry friends disappeared forever from our regular doggie meet-ups. The subsequent news of the massive dog food recall completely shattered these already devastated dog parents, while sheer panic set in among our whole dog community. That marked the beginning of our journey into dog food research. Around the same time, our own beloved doggie and best friend in the whole world, suddenly developed grand mal canine seizures. He was 8 years old. And he was gone six months later. Prior to his illness, our precious furball had been healthy and sprightly, with the zest for life of a puppy! The only times he'd ever needed a vet was for his annual vaccinations (another controversial topic! ), and once for a minor paw infection. We struggled to find the cause. We prayed it was merely an allergic reaction, or some issue we could treat. Our frantic quest for information on canine seizures, now led to even more in-depth dog food research. Our little pooch had recently developed a newly acquired taste for rawhide bones, and we were happy to indulge him. Soon, however, it dawned on us that he appeared to convulse within a few hours of gorging on his rawhide chews. We put our theory to the test and sure enough, our little dog had seizures each and every time! Now, while we obviously can't prove anything, we will always live with guilt and many questions. The loss of a loved pet is always very traumatic. But living with the notion that our naivety may have inadvertently caused his suffering and untimely death is unspeakable. We will soon be adding to our articles on Dangerous Foods for Dogs, with our findings on rawhide bones. Our present baby (yes, that's him plastered all over this page), was born on Valentine's Day, 2008! He entered our lives at 9 weeks old, with his gorgeous, green eyes and bushy tail that's never stopped wagging. Our rambunctious "Dood" is the friendliest little kid on the block, and the life of the dog park. My favorite puppy memory of him, is me making business calls from my home office, while he nibbled at my toes. Bear in mind, puppies have needle-sharp teeth! However! We also very quickly discovered that our little dog has skin allergies. Over the past couple of years, we've gathered such a wealth of information and knowledge on dog food, and it's been an incredibly time-consuming and exhausting exercise. We've become the dog food "know-it-alls" at our local doggie park! We're often approached by various dog parents asking for tips and opinions. It's not unusual for someone to call us from a pet store, and rattle off the ingredients label for our input. Well, that's quite enough about us for now. We hope you find our site informative, and we'd love to hear from you if you'd like to leave us a comment.